SURVEY: Urban Airship has studied US and UK mobile wallet usage. Click to enlarge. The majority of US and UK consumers (54%) have now used a mobile wallet, research from Urban Airship reveals, with 30% of respondents using them in the past week. 60% of the 2,000 respondents have used a loyalty programme within their mobile wallet and 67% want to do so. 53% of consumers have used coupons and 62% want to. 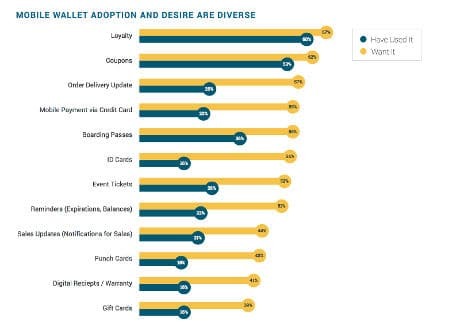 22% have made a credit card payment via a mobile wallet and 57% want to do so, while 16% have used gift cards through a mobile wallet service and 39% want to do so. In the last three months, 67% of millennials have used mobile wallets, compared to 51% of respondents aged 35 to 54. 62% of respondents with household incomes greater than $60,000 have used mobile wallets in the last three months, compared to 39% with household incomes below $60,000. 84% of millennials and 80% of respondents with household incomes of more than $60,000 are more likely to use mobile payments if loyalty rewards and discounts are automatically applied. 69% of respondents are also more likely to use their loyalty card if it’s on their mobile phone. 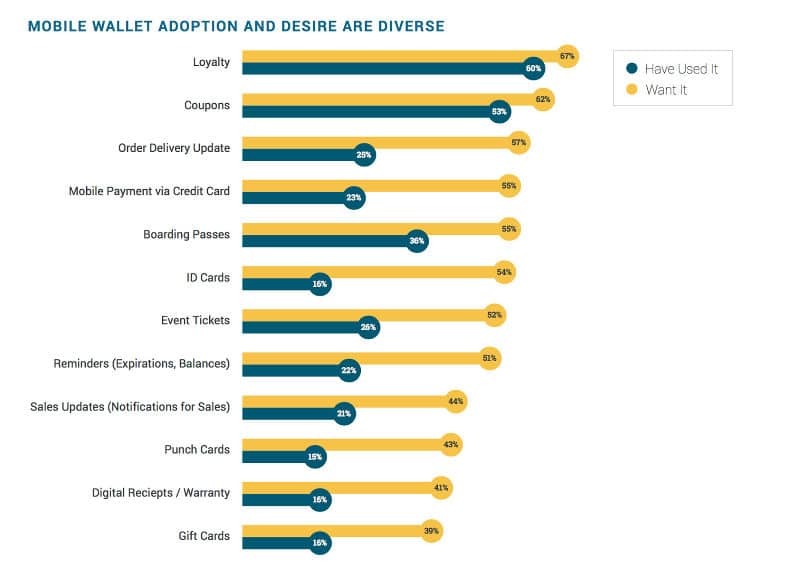 73% of those surveyed are also more likely to join a loyalty program if points and rewards are automatically updated and immediately visible on mobile wallet loyalty cards. If respondents receive expiration reminders via their mobile wallets, 64% are more likely to make use of the coupon. “Mobile wallets, the report says, are now among the top four ways consumers prefer to stay updated on sales, offers and coupons, alongside decades-old channels including websites, email and text/SMS,” the company says. “Businesses are looking for new lightweight, service-oriented ways to communicate with customers on mobile, and our findings make it clear that mobile wallets will lead the next wave of mobile engagement,” says Brett Caine, CEO and president of Urban Airship. “There is a shift underway in how consumers want to interact with brands. This report is at odds with the pessimistic predictions popular as recently as a year ago. What consumers resist in the abstract, they love in practice. Mobile is simply more convenient than cards. Contrary to all the FUD, it is also more secure. What’s not to like?